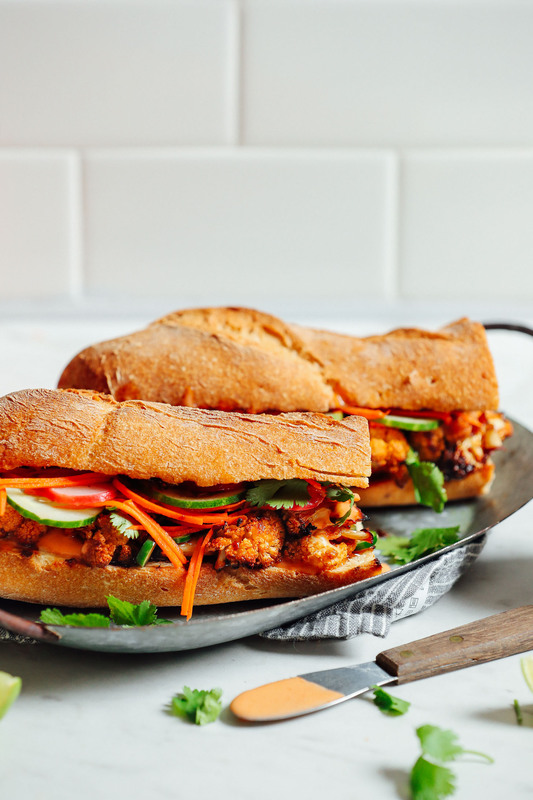 Friends, behold: The Vegan Banh Mi Sandwich. 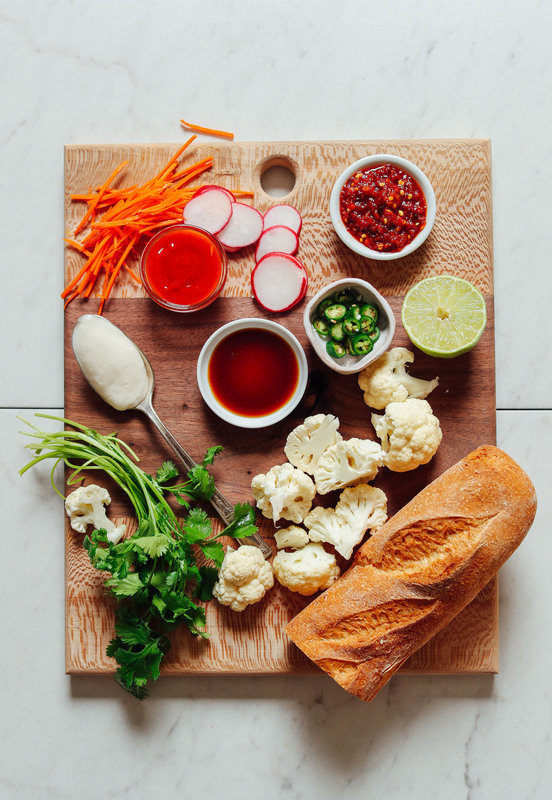 Consider this my spin on the popular, classic Vietnamese sandwich. So many versions I’ve seen rely on tempeh or tofu as the main filling. But I couldn’t help but wonder if the humble cauliflower could step in and take its place, because it’s fast to prepare, absorbs flavors well, and is so delicious when stir-fried. Spoiler alert: It totally worked. This recipe comes together in 30 minutes! Yep, that fast, which means it’s lunch- and dinner-friendly (quick meals for the win). It starts by quick-pickling radish and carrot in vinegar, a little salt, and sugar. This makes them crispy, salty, tangy, and a little sweet. Next comes the main event: the cauliflower. First, we marinate it in a simple spicy, savory sauce. Then we sauté and finish by roasting in the oven until tender. Mmm, roasty. 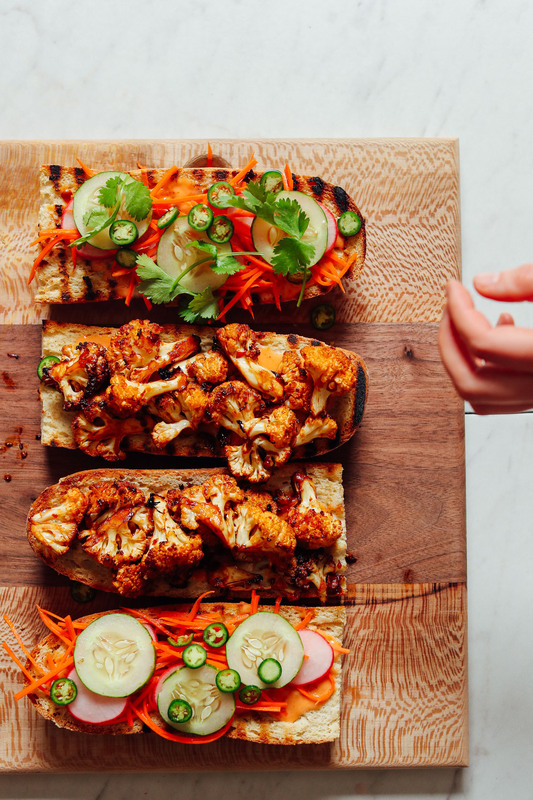 Once the 3-ingredient sriracha mayo is made and the bread is toasted, it’s time to assemble! First aioli, then cauliflower, then pickled vegetables and garnishes. That’s it! This would make the perfect meal when you’re craving a sandwich but want something more than PB&J. It’s the perfect marriage of textures, temperatures, and flavors. Enjoy as is or pair with these Vietnamese-inspired Spring Rolls! 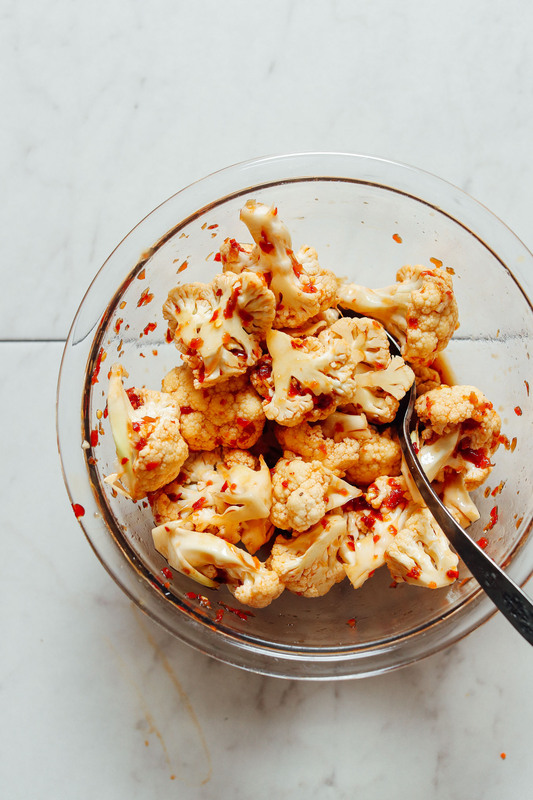 If you’re into cauliflower, also check out our Curried Cauliflower Wings, Cauliflower Rice Stir-Fry, Gochujang Cauliflower Wings, Curry Roasted Cauliflower Kale Salad, and The Best Whole Roasted Cauliflower. 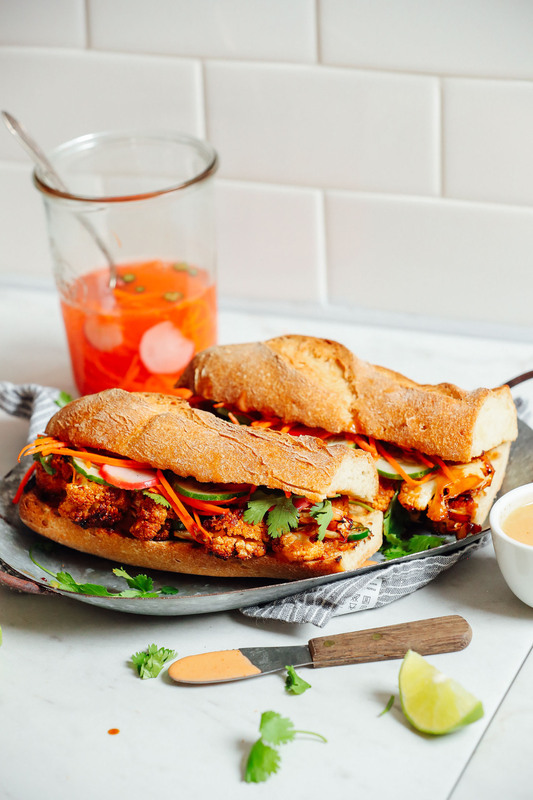 Vegan Banh Mi Sandwich made with savory, caramelized cauliflower, sriracha mayo, and quick-pickled vegetables. Just 30 minutes to make this hearty sandwich! Prepare pickled vegetables first by adding vinegar, hot water, salt, and sugar (or stevia) to a glass jar and shaking or stirring vigorously to dissolve salt and sugar. Then add carrot and radish, stir to coat, and push down to submerge. Cover and place in the refrigerator to chill, where they will "quick pickle" until sandwich is ready. Leftovers will keep in the refrigerator up to 1 week (sometimes more). To a medium mixing bowl, add chili garlic sauce, coconut aminos (or tamari), maple syrup, lime juice, and oil and stir to combine. Then add cauliflower florets and toss to combine. Heat a large rimmed oven-safe skillet over medium-high heat. Once hot, use a slotted spoon to scoop the cauliflower into the pan, reserving most of the liquid in the bowl. Sauté, stirring semi-frequently, until slightly browned on the exterior. Then add most of the reserved marinade (saving a little for serving) and toss to coat. Transfer pan to the oven and bake until crispy on the outside yet tender on the inside - about 15 minutes. In the meantime, prepare aioli by adding vegan mayo to a small mixing bowl with maple syrup and sriracha. Stir to combine. Then sample and adjust flavor as needed, adding more sriracha for heat or maple syrup for sweetness. Set in the refrigerator until serving. Slice the baguettes in half and toast in the oven (facedown directly on the oven rack) or on a hot grill pan until slightly browned. Then assemble: To the baguette, add aioli to both sides of the bread. Then to one side, add the cauliflower and brush on any leftover cauliflower marinade for more flavor. Last, add pickled vegetables, cilantro (optional), cucumber (optional), and jalapeño (optional). Enjoy. Best when fresh, though can be made in the morning and enjoyed for lunch - just refrigerate to keep fresh. Store leftovers separately in the refrigerator (except any un-toasted bread) up to a few days. Not freezer friendly. *You could also swap the bread for lettuce cups or a collard green wrap to keep this grain-free! *Inspiration taken from the New York Times. *Nutrition information is a rough estimate for 1 sandwich calculated without optional ingredients or toppings. Delicious!! Didn’t want my sandwich to end! Made this for the first time tonight using pretty much the same recipe except for substituting shoyu for tamari. It is FABULOUS! My husband has been working nonstop for the past couple of weeks to meet his deadline and the banh-mi brought a smile to his otherwise stressed face. My meat eating, pork bahn-mi loving husband absolutely loved this recipe (as did I!). The flavors are spot on and really capture the essence of a classic bahn-mi. Will definitely make again and again! This was the bee’s knees! Super easy to make and extremely flavorful. Everything was so well balanced between savory, sweet and spicy. My husband loved it also! I followed the recipe exactly and it was delicious: VERY SPICY, very flavourful. The next time I make it, I will keep all of the marinade aside and serve it as one of the condiments. But if you like it spicy, go for it. This recipe is a keeper! This was a quick cooking and really flavorful dish. Almost four months meat free and dishes this full of flavor really hit the spot! This was delicious! I made this for a Sunday evening with my boyfriend. He is not vegetarian but I am. I always like to make us food that is very flavorful. This was great! He couldn’t stop eating! He wanted more. I loved it too. It was very spicy which I love but I know spice can be hard to handle for some people. But it was just great. These are amazing! I think my favorite of your recipes so far. Just as good, maybe better, than the Bahn Mi joint I have steps from my apartment. I added mushrooms in with the cauliflower. Yummmmmmm!!!! Oh man. Made this recipe tonight. Flavor bomb! Thanks! Honestly this recipe is so good that I’ve started using the sauce for all sorts of other dishes. It has so much flavor and I was super impressed with how it turned out. I never leave reviews, but I feel like I HAD to say something about this incredible recipe. It is to die for! The combination of flavors is overwhelmingly delicious, and although I often tweak recipes to my taste, there isn’t a single thing I would change in this sandwich. My husband and I love making this because there is always enough for us to have it for dinner two days in a row…score! We just refrigerate the leftover cauliflower and veggies and assemble them on french rolls again the next day! Mmmmmmmmm. Thank you so much for your creative, beautiful recipes. You’re my fave! I have made this sandwich a few times and love it!! I decided to get creative and add the ingredients to a pizza instead of a sandwich. I leave off the radishes because I am not a fan. I added Miyoko’s vegan mozzarella cheese. It was seriously the best pizza I have ever had!!!! Incredible! Every part of this complemented the other. It so so flavorful! I can’t wait to make it again. We’re so glad you enjoyed it, Daniela! 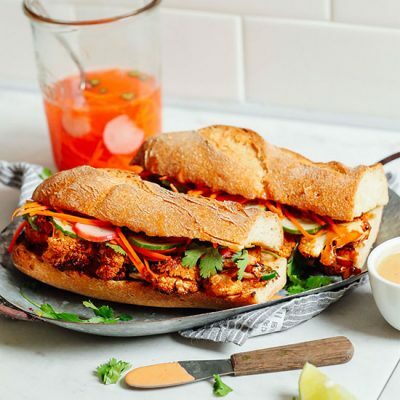 I was looking for a non-tofu filled Banh Mi and here it is! 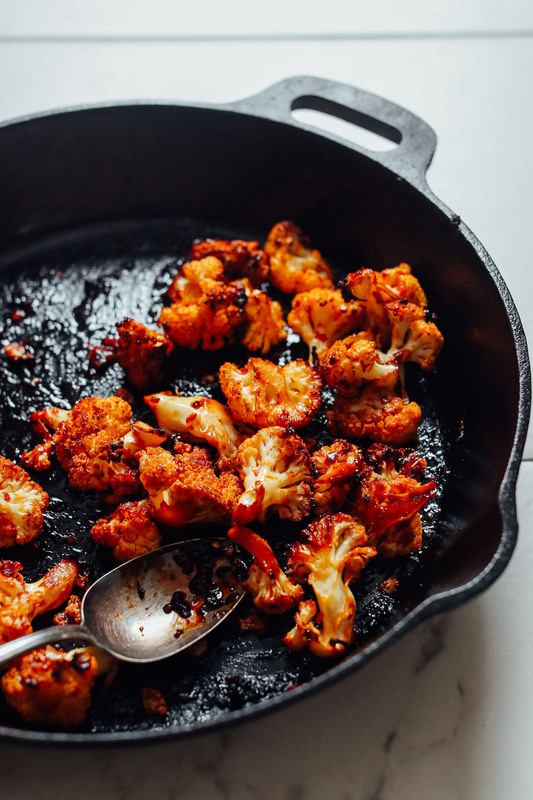 I had to tone down the spiciness (and my kids won’t eat the cauliflower for some reason), but my husband and I thought it was delicious! My favorite part is pickling the veggies. This is one of those recipes that once you do the initial time investment, it’s pretty easy to whip it out again. Thanks for your awesome recipes! Made this for the first time tonight. My family DEVOURED it and we will make it a regular meal for sure. Could have eaten 2 more helpings if we hadn’t run out of rolls! One of the best vegan dishes I’ve ever had. I will be making this ASAP (as well as several other recipes). Crazy because although I have tried several of your recipes (love) and consider your site a go-to, I somehow never noticed the mention of your recipes being plant based. Guess I was blinded by the goodness? You are gonna make me go vegetarian again lol. We’re glad you enjoyed the recipe! We tried and loved this. Outstanding flavours. The sriracha mayo and the pickles are amazing. For those that like a little less bread or don’t like baguette, we also tried the same ingredients in a wrap. That worked great too. This came out SO GOOD! It’s hard to find new vegan sandwich recipes that don’t call for tofu. I’m so glad I found this one. I was a little nervous about the chili sauce as I typically find your recipes to be a little too hot/spicy but it ended up being fantastic. I ran out of soy sauce making this recipe but it worked well with 1/2 the amount in the recipe. I will definitely be making this again. this was so delicious! that marinade is to die for… lick the spoon good! i only ended up using half a head of cauliflower to get the 4 heaping cups, but there was enough marinade and aoli to double the amount of cauliflower. And it was so good I wish there were leftovers so next time I’d use a whole large head of cauliflower, and probably double the pickled vegetables because it would be nice to have extra on hand for other stuff throughout the week. I also used gochujang instead of sriracha, because i dont really like sriracha. Great recipe thanks! I want to make the Banh Mi sandwich but I don’t like mayonnaise. What can I use as a replacement? You really don’t taste the mayo in the aioli! I’m not sure what you could use in place of it, but if you experiment with it, let us know how it goes! This was so delicious, Dana, that I’m hatching a plan to have these all month and make them in large batches. Frozen, at some point, somehow. Before the saute? Really. These are incredibly satisfying and delicious. I never bought coconut aminos before but now they may be my go-to, so thanks for the tip. I couldn’t quite make them in 30 minutes this first time, but maybe with more planning and practice I could. This is one of the best things I’ve ever made! 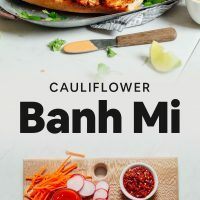 It tastes almost EXACTLY like my favorite vegan restaurant’s Bahn Mi but with cauliflower of course. I don’t react well to too much soy so I try to stay away from it when I can (except for my love for soy milk). It was seriously delicious and not too hard to make. I can’t wait to take it for lunch tomorrow! OFF THE CHAIN! Holy wow this sandwich rocked it! It’s my new fav recipe. My husband absolutely loves this sandwich and requests that it is in the weekly rotation. I made the recipe 3 times in the past week, and passed the recipe onto my friends with a note “you MUST make this for your next meal”. I followed the recipe to a T on the first batch, subbed tamari for the amino acid on the second, used radishes because I was out of carrots on the third. It’s all good, trust me, but my favorite is exactly like Dana suggests. I avoid oil so I did not not use the aioli on the second and third sandwich, still absolutely delish! Thank you, thank you, thank you Dana! I so very much appreciate your cooking style, quick but delicious. I no longer scour the web for vegan recipes (and I’ve been vegan for 6 years), I go straight to your website. Thanks again, you rock! Yay! We are so glad that you and your husband enjoyed this recipe, Jennifer! Thanks for sharing your changes! We made this for dinner last night and it was so good! We added some cayenne to the cauliflower and also used a whole grain bread, but it’s all about the flavors from the sauce, pickled carrots, and the cauliflower! Yum! Also loved how easy it was to make the mayo. Vegan mayo can be hard to find or expensive. My husband and I recommend your site to people looking to cut down animal products. We appreciate that you don’t use too many obscure ingredients and that every recipe we try always tastes amazing! This was super delicious and flavorful – the spice builds with each bite, in a good way. Thank you! I made this tonight for dinner and OMG!!!! The flavoring was AMAZING! You never cease to amaze me with your delicious recipes!! Hey great recipe- just had this for lunch today. Changed it a little by using normal mayo as I am not actually vegan and added some raw red skin peanuts to the cauliflower process. I am going to reuse the pickled veg liquid mix again as it crisped up my veg mix beautifully. This was delicious! My husband who is a meat eater loved it too and went back for another half sandwich. I didn’t have coconut aminos so I subbed Bragg’s (not sure how different the flavors are, I’ll have to find coconut aminos before I make it next) and I subbed sweet chili sauce (which does have garlic in it) for the chili garlic sauce. I think next time I’ll skip sautéing the cauliflower and just toss in the sauce and roast in the oven. I’m definitely going to have to make this again later this week. Soooooo goooood! This is delicious! Seriously. I was a bit nervous with 2 tbsp of garlic chili AND the spicy aioli but DANG it all came together so nicely. With the pickled carrots and radishes and cucumber, it cut the heat just enough that all the flavors came together great. I made the recipe for 2, but I’m pretty sure I’ll end up with 3-4 meals when all’s said and done. I’m so happy with how this recipe turned out – I will definitely be making it again soon!! I think next time I will thinly slice my carrots and radishes, I only have a one size grater, so my pickling turned them more into a paste versus clearly defined veggies. It still tasted fantastic, so I’m not complaining!!! Made this last week, making it again it was that good! Your recipes are the few I make for friends without testing them first, I know it’ll come out great. Thanks! This was fantastic! It received rave reviews from my husband, 10 year old and myself. We will definitely make this again. Whoop! We are so glad to hear that! I just finished eating this and am still speechless. I subbed the cauliflower for soy curls (trying to use what I had on hand!) and it was incredible. My husband requested that we add this to the weekly rotation and then insisted on cleaning the kitchen. Bless you!! I made this for dinner and we all loved it, my 12 year old, 16 year old and her boyfriend. I made it exactly per the recipe, used commercial veganaise, purple cauliflower (super pretty, wish I had taken a picture but it was devoured so fast), and I slices the cucumber super thin with a regular veggie peeler. Thanks for posting. This one’s a keeper. Kids are asking for it in their lunches…I’m not that much of a morning person though. I made this recipe with my friend and it was SO AMAZING. I couldn’t believe that we had made it ourselves! The taste was amazing, the sandwich itself was so beautiful. I can’t wait to make this sandwich again. Whoop! We’re glad to hear that, Dianna! I just made it and its AH-MAZING. I was skeptical about how the pickles would turn out but they were perfectly tangy..juuust might add the jalapeños into the mix next time. The cauliflower was my favorite part though, juicy and packed a lot of flavor! I was out of vegan mayo and sriracha so I ended up subbing it with hummus and adding lots of chili flakes. YUM. Whoop! We’re glad you enjoyed it, Mallory! I made this but I am must not be able to handle so much sodium even issuing the aminos was a lot. This was very delicious but will not make again just because of sodium I will definitely use this idea to make other things. Thank you again for all your great recipes! ohhhhhmahhhgawwwdddd. I just made this for a late lunch and it was TOO DIE FOR! Seriously so, so good! Thank you for this recipe! Hah! We are so glad to hear that, Britney! I just made this for dinner tonight and we absolutely loved it! De-LICIOUS! My husband LOVES bahn mi sandwiches and now that we’re vegan he hasn’t had it recently. I saw this recipe in my inbox this morning and immediately went to TJ’s to get the goods. Everything was perfect on the recipe and made for a delicious dinner. Thank you again for filling our bellies with healthy eats! This looks delicious…But…Is the sodium content accurate? That is a lot of sodium! The NY Times recipes has a lot but much much less! Just curious! Hmm, it all has to do with the brands you use. Perhaps ours was calculated with higher sodium ones. You can always try cutting back those ingredients, like coconut aminos or tamari! Just so good! Made as written. We will be having this again! Perfect!! Thanks for sharing, Amy! Wow. Easy. Delish. Only sub I did was didn’t have radish so added thinly sliced red onion and some packaged Cole slaw mix to my pickled Veg. Will definitely make again. Smart! Thanks for sharing, Kelly! So delicious and satisfying! I was literally dancing in my seat as I ate it. Thank you for making life that much better, all the time! Yay! We are glad to hear that, Nikki! Run don’t walk to the kitchen. This was incredible. My husband who is a picky newly vegan demolished his sandwich and went back for a second! My only issue was that there was not enough! Perfect combination of salty and sweet. So many flavors that compliment each other perfectly! Dana this was amazing! I had to use soy sauce instead of aminos, so I felt the sauce was a little wet but gladly put the rest in a jar to pour over rice and veggies later ;) SO tasty. My boyfriend frequently eats Viet pork rolls and smashed his baguette of this in under 5 minutes. Keep killing it! Whoop! Thanks for sharing, Annalise! As a Vietnamese woman myself, I approve! The cauliflower looks so flavorsome. I’d just eat it with the baguette any day! Cheers! Hmm, if it bothers you I know there other brands of chili garlic sauce out there! Otherwise, I’m sure there are some recipes for a DIY option. In the meantime, I’ll add recipe testing for one to our list! Perfect! Such service and molte grazie! If we want to make these recipe for 10 people, then How much “rice wine vinegar” should we use for it. :-) I am very keen to make this recipe and I am still thinking that soon go to the kitchen and start making this method. We have a function at the top of the recipe box to increase the serving size. Right now it’s at “2 sandwiches” so I’d suggest increasing that to 10 sandwiches. With that being said you likely don’t need *quite* that much vinegar, so just maybe try tripling it and going from there. Hope that helps! I want to make it so bad, it looks delicious! but the only ingredient that I’m missing is chilli garlic sauce….any sub?? Sriracha? Or you could chop up a spicy pepper and some garlic and make a paste? Lovely! Thanks for sharing, Nika! Yes Dana, this looks so good! The first banh mi I had was from a food truck in Scotland and the filling was pulled jackfruit, which was fab. I look forward to trying your version. YAS QUEEN!!! Can not wait to make this!